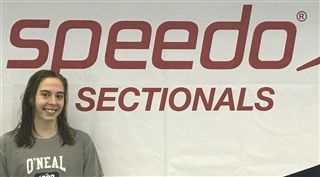 Representing the O'Neal Pelagics Swim Club, Hannah competed at the 2019 Speedo Sectional swim meet on March 8th and 9th along with the fastest swimmers from North Carolina South Carolina, Georgia, Alabama, West Virginia, and Minnesota. Hannah swam the 50 free, 100 free, 200 free, 200 IM and 100 fly and made finals in the 100 free! This meet marks the end of her senior year long course season and an amazing comeback year to the sport of swimming! Way to go Hannah Burns!